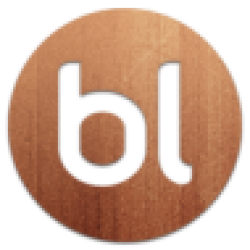 World's #1 Blog Platform designed for book bloggers, reviewers, writers - all Book Lovers. 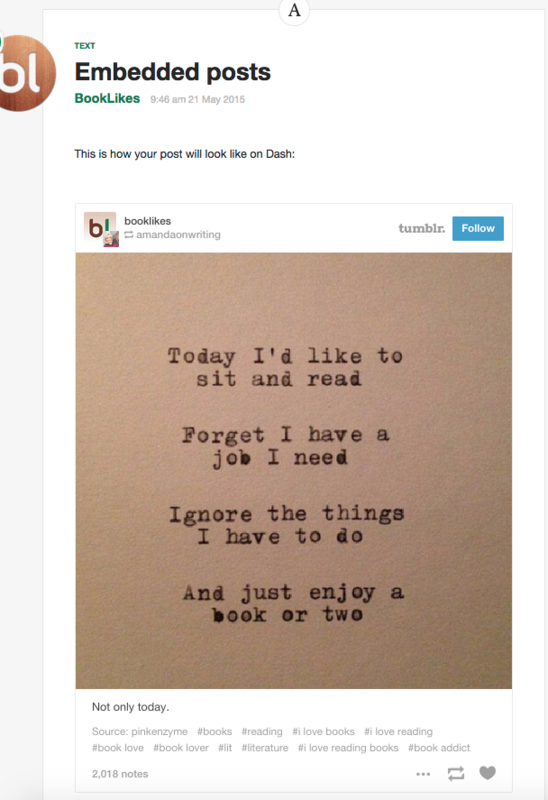 Your Reading Life. Redesigned. 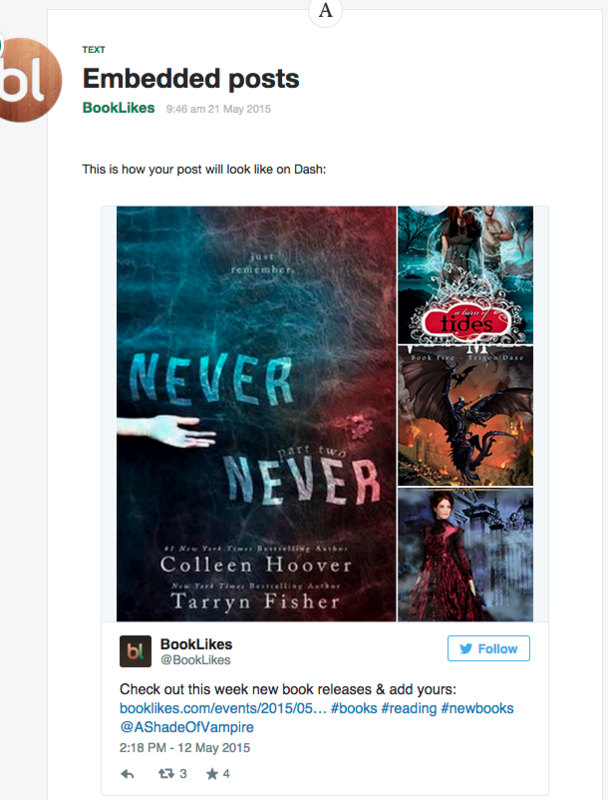 Embedded post is a simple way of adding a public post published on other platforms to your BookLikes reviews and texts. 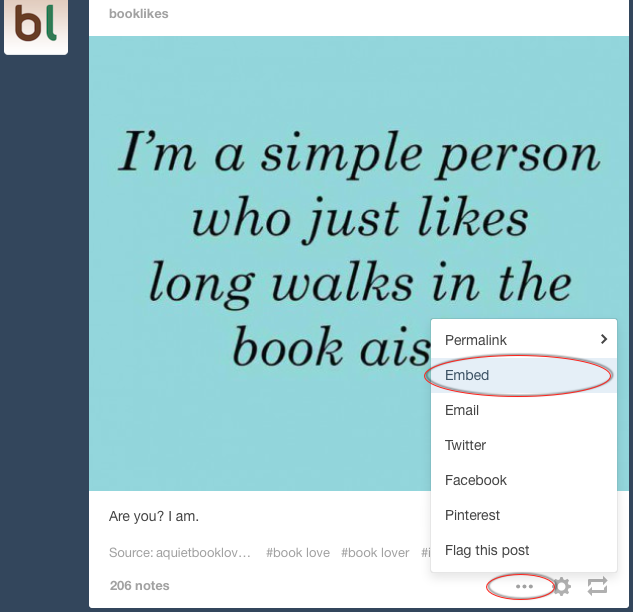 Now you can spice your posts with embedded Tweets and Tumblr content. Here's how. 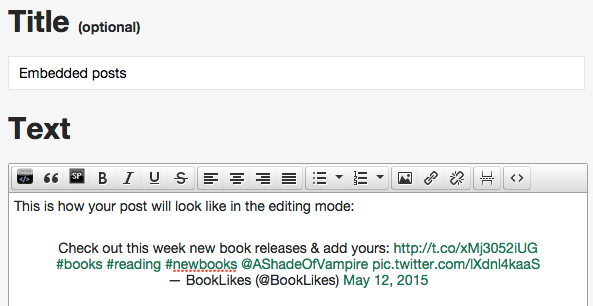 Grab the codes and paste them into the writing box on your BookLikes. But when you save to Draft or Publish... Voila! 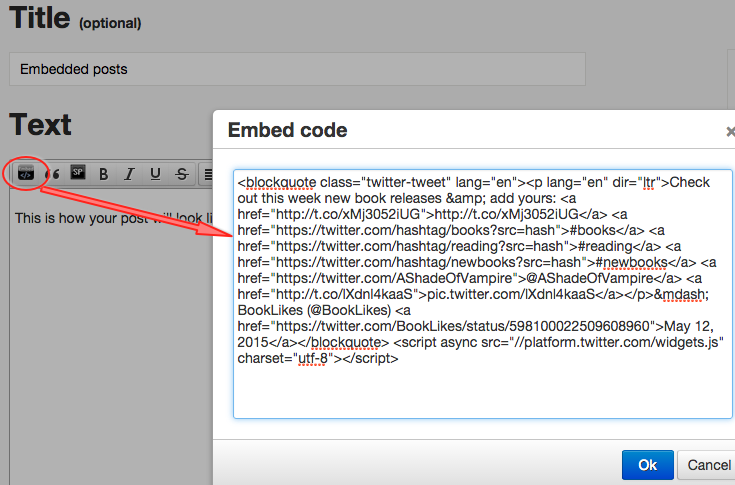 Your first embedded post is ready and looks great! P.S. For video scripts: remember to use the Video type pots. 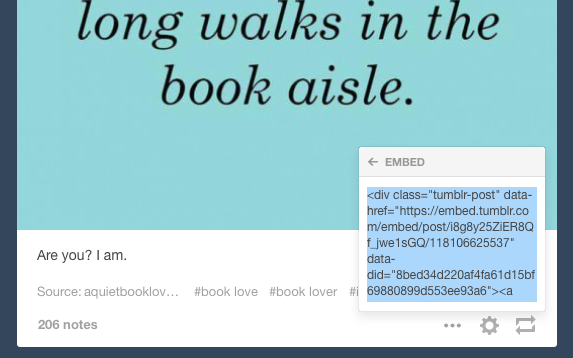 Why it's great to use the embedded posts? 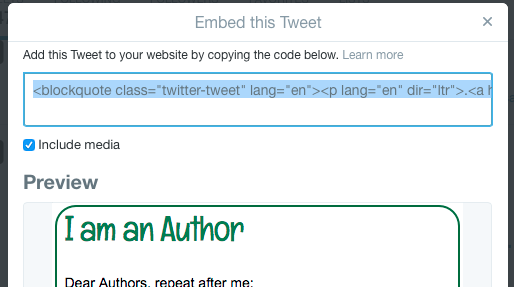 Thanks to the embedded posts you can share the news, support the author of the post, and spice your texts with real-life examples. It's also a great way to show the reference sources when you want to quote a person or refer to the idea published on somebody else's profile. The embedded post always shows the author and the source link making it easier for the reader to go back to the original text, profile or post. Why not to embed the Tweets and Tumblr posts to trigger the discussion? 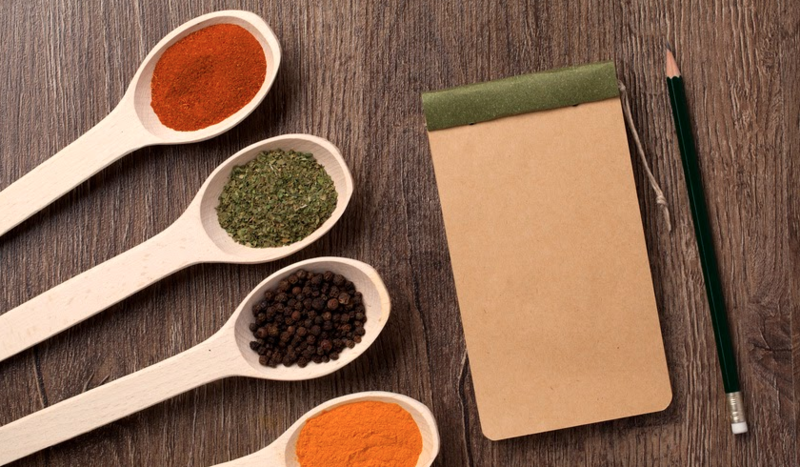 The more diversified your posts are, the more popular your text will become. We bet your followers will love to engage in the discussion where they can view different point of views with supporting examples. 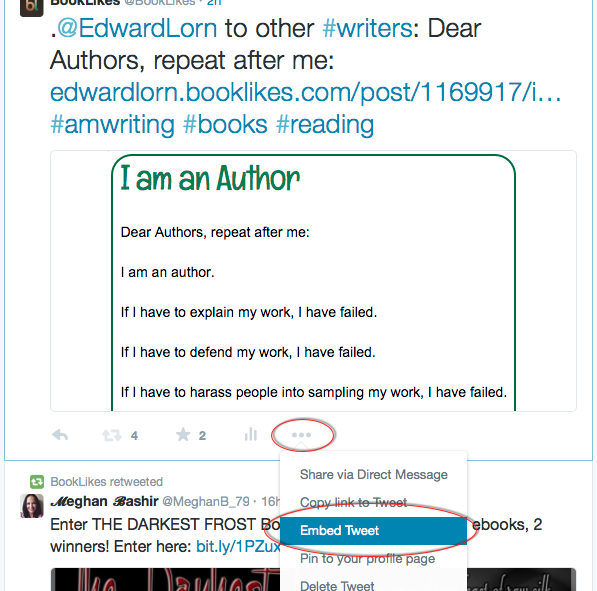 In consequence, this will boost the engagement and turn your readers and followers into active participants of your BookLikes webpage. Finally, you can use the embedded posts to show your best content from your social media and gain followers on various platforms you're active on.